"Content sharing and collaboration is very significant when it comes to team meetings whether internally or externally thanks to how it enables teams to share ideas, brainstorm together, and make better decisions." In today's modern work spaces, huddle and meeting rooms are equipped with displays, or projectors for content sharing during internal meetings. Conference room systems are also added to those rooms to connect them to the external world. For organizations that are using Microsoft Lync as their Unified Communications, and Collaboration platform, there is a great opportunity to extend the great Microsoft Lync video conferencing and content sharing features to those work spaces with the right Lync Room System solution. At Vytru, we take content sharing into deep consideration when building our Microsoft Lync Video Conferencing solutions. For us, it has no less significance than video communication in the conference room. We always work hard to make our Lync video endpoints easy to use for end users. You should be able to share content easily, the very first moment you enter the meeting room and interact with our system. Easiness of use is not the only factor we have considered, but also giving the end user multiple sources and options to start a content sharing session. On the RVC, Room Video Conferencing system for Microsoft Lync which Vytru's flagship Lync Room System, we have innovated in content sharing capabilities of the system both while you are in meeting room having an internal meeting with your team, or when you are on a Lync conference call with external participants. So How is Content Sharing Handled with Vytru's RVC? There are three ways to share content on the RVC system. You can share content for an HDMI input, a USB Flash Drive, or wireless from your own device (laptop, tablet, or smartphone) using AirSharing technology. On the RVC system, you can share content from any laptop, tablet, or smartphone directly to the Vytru's Room Video Conference system leveraging our Wireless Content Sharing technology, AirSharing. All you need to do is walk into the meeting room with your own device, and without having to download or install any application, connect to RVC system via MiraCast or AirPlay. Then, the RVC system mirrors your device to the system and enables you to share it with in-room attendees for internal meeting, or with remote meeting participants for Microsoft Lync audio or video conference calls. With RVC, you get this amazing BYOD Wireless Sharing experience with no need for an external wireless presentation system, media server, or additional licenses. You do not have to carry your laptop to the meeting room every time you have a presentation or have something to share with your team or in a Lync conference call. With RVC, you can put the content you want to share on a USB Flash Drive, then plug it into the RVC Codec. Launch "Apps" from the Start Screen, then "Browse" and you will be able to browse the folders and files on your USB Flash drive. Select the file you want to share, and tap or click the file icon to start content sharing. Only Word, PowerPoint, Excel, and PDF files are currently supported. This is the traditional way to share content in the meeting room, and it is also supported by the RVC system. You will need to extend the HDMI input cable to the middle of conference room table so that it is accessible by every one. End users will connect their laptop to the HDMI cable and then their screen will be mirrored on the RVC system. Writer's Note: This blog post is about centrally and automatically adding Lync contacts in Microsoft Lync for all users within an organization. The audience targeted are mainly Lync Administrators who are looking for a way to manage their employees' Lync contact lists. It is not meant to give you instructions on how to manually add Lync contacts to your Lync contact list. For more information on how to add Lync contacts manually, please visit this link. There is no such way to add a Lync contact list template to all users in the Microsoft Lync Server. Lync Administrators are always challenged by the fact that their Lync users do not have consistent and updated Lync contact lists. Business Productivity teams within an organization believe that having a central Lync contact list template(s) that is populated to all Microsoft Lync users is key for thier day-to-day interaction with the Microsoft Lync client. We could not agree more. The Lync contact list is so important for Lync users' adoption, and so is the users' time. In order to increase Lync users' adoption and save your employees' time by not letting them build their own buddy lists, you need to do this for them as an Admin. Yet, at Vytru we have a great solution for this. Contacts Manager for Microsoft Lync is a central and automatic Microsoft Lync contact list management software. It enables Lync Administrators to populate pre-set Lync contact list templates to all their users automatically. With Contacts Manager for Lync, Lync users will not have to build their own buddy lists any more. This will save them more time to be productive and focused on making the right communication with their colleagues. For Lync Administrators, Contacts Manager for Lync provides a very easy-to-use and intuitive User Interface. The software is straight-forward and does exactly what you need it to do. With four easy steps, you will be able to build, assign, populate, and update Lync users' contact lists. No more needs for doing this manually for them or using Scripts that does not work well all the time and has less features than Contacts Manager. Firstly, after launching Contacts Manager for Lync, right-click on "All Contact Lists" on the left side Console Root and click "Create". This will create a new contact list template that you can edit. I will name it as "Corporate Contact List". So how to add Contacts in Microsoft Lync with Contacts Manager? Once the contact list template is created, right click on it and select "Create New Group". You can create Contacts Groups based on your organizational structure, departments, project teams, or locations. Here is how your Contact List with Contact Groups will look like, those group are now empty so the next step is to add relevant users to them. Contacts Manager for Lync syncs with Active Directory domain to load your Lync users. Click your domain from the list of Active Directory Domains and right-click on any users to add them to the contact list and contact group. You multiple select and filter users. Continue building your Lync contact list template till it is done. Now that your contact list template is almost done, you need to assign it to your Lync users. Assigned Users are the group of users to whom the Lync contact list will be populated. Each contact list in Contacts Manager, has Contact List and Assigned Users. Open your domain from Active Directory Domains to load your users. Right-click on the user you want to populate the contact list to, and hit "Assign User to Contact List", and select the contact list you want to assign the contact list to. Last step is to populate/push the contact list to the assigned users. Right-click on "Assigned Users" on the contact list you want to push and select "Populate Contact List". Your Lync contact list tempalte will automatically be populated to all the users added to "Assigned Users". It is as simple as that. Contacts Manager for Lync is a simple and cost-effective Lync Administration Tool that will increase users' productivity and Microsoft Lync ROI as well. You can find out more about Contacts Manager by visiting the product page by clicking here. Vytru is excited to be a Bronze Sponsor at the Microsoft Lync Conference 2014. Microsoft Lync Conference 2014 is the place where the global Lync Community gathers to explore the latest advancements in Unified Communications at the only comprehensive event in the world dedicated exclusively to Microsoft Lync and supporting solutions. We are pleased to meet with the enthusiastic and vibrant Lync community including, Microsoft’s Lync team, Lync MVPs, Unified Communications thought leaders, and customers. The global Lync community is shaping the future of the Unified Communications and Collaborations industry and is helping the transformation of how people connect at work today. Vytru is Microsoft Gold Communications Partner that is building apps and hardware for Microsoft Lync, as well as providing support services for the platform. We capitalize on three years of experience in the Lync domain, and a software and hardware portfolio of Lync products that are built to meet needs, add value, and extend the Unified Communications platform. Please, visit Vytru at booth #713 to see our new Lync products and have a discussion with our technical and business teams about all things Lync. We cannot wait to see you there! Follow us on Twitter at @Vytru for a comprehensive coverage of the Lync Conference 2014. In this blog post, i share my own observation of the Lync room video conferencing market in 2015. Microsoft Lync is rapidly becoming the platform of choice for organizations looking at a Unified Communications solution. Video Conferencing with Microsoft Lync is one of the features that are bringing more traction and attention to Lync. Recently, more and more organizations are thinking of bringing Lync to their conference rooms to replace the disparate, outdated video and telepresence systems in favor of a unified video conferencing experience with Lync on PC, laptop, smartphone, and tablet. The massive growth in demand for Lync video conferencing systems reinforces the importance of extending Microsoft Lync to the conference rooms. The impact of deploying Microsoft Lync Room Video Conferencing systems does not only increase user productivity, enhance internal and external communication, and reduce travel costs, but also it does unify the Unified Communications and Collaboration experience across the organization, and across all devices. Lync Room Systems are no longer to limited to what Microsoft and its partners have to offer, more start-ups are leveraging this market trend and are competing to win market share. Organizations are not willing to invest more money on interoperability hardware or software media gateways to connect their legacy video conferencing systems with their Lync infrastructure. Legacy systems in the conference room that cannot do Lync integration out of the box will not be able to make/receive calls to and from Microsoft Lync users or other Lync Room Systems. And this is when the company looks for solution to do this interoperability. Having two disparate systems will require a lot of investment in media gateways, licensing, maintenance, and IT overhead. Organizations simply want to adopt a native Lync Video Conferencing solution to leverage their Microsoft Lync infrastructure investments and have a Lync experience in the meeting room similar to that of the PC or laptop. So, after working with temporary solutions for a while, replacing those legacy systems with Lync-enabled solutions becomes on their alternatives. When organizations start to look for a Lync Room System solution, they are faced with two challenges. The Cost of those systems and the Integration they offer with their existing audio/video gear. These two challenges hold users back from extending Lync to their video conference rooms. The existing Lync Room Systems in the market offer an over-priced combo of Microsoft Lync Room System edition with interactive boards, webcam, and audio systems. Those systems are not ready to be customized, and are very expensive, and does not work for all rooms. Simply, one size does not fit all. 1- No fixed room identity (No specific Lync account for the room, use would use their own Lync accounts to sign in). 2- PC's OS maintenance and updates. 3- No enterprise-grade management for the DIY conference rooms since all are using dedicated PCs. 4- Some issues related to connected peripherals like camera and speakers and switching between multiple devices like those. 5- No great user experience of the desktop Lync client in the meeting room. 6- PC control is limited to one meeting participant and there must be a meeting moderator to control the meeting. RVC3000, the Room Video Conferencing system for Microsoft Lync is a Lync Video Conferencing codec that runs Vytru's full-featured software that delivers an unmatched Lync experience for the meeting room while reserving the same Lync user experience. The RVC3000 is extremely simple to setup, very easy to use, and can be customized and integrated with USB Video Cameras, USB audio systems, and a wide range of TVs, Touch Displays, or Interactive Boards. The RVC3000 Codec re-imagines "Do-IT-Yourself" by providing you with the Soft Codec that has unlimited integration and customization options. As a result, this can cut down costs of adopting Lync Room Systems pretty much by leveraging existing audio and video gear or by customizing systems that fit your needs. In this blog post, which will be part of a series dedicated to Lync contact List management best practices, we will discuss how Lync administrators can automatically and centrally manage, populate, and update Lync Contact lits, contact groups, and contacts to all Lync 2013 users. At the inital stage of rolling out Microsoft Lync client to end users, or after having Lync running in the organization for a while, administrators are challenged with the Lync contact list managent task. 1- Lync end users will need training on how to manage their own Lync contact list. 2- They will spend time working on building contact groups and adding contacts to them. 3- They will not build relevant, consistent contact list that reflects the organization’s address book. As a result, the Lync user adoption rates will go down, the level of communications and collaboration expected by Lync will not grow up to the expectations, and thus IT administrators are asked to solve this problem. Contacts Manager for Lync software is a central and automatic contact list management solution that enables the admin to build contact list tempaltes and populate/push them to Lync end users in few seconds. 1- Build Lync contact list templates by syncing with AD. 2- Assiging those Lync contact list templates to end users. 3- Populating the Lync contact lists automatically to the end users. 4- Updating the contact list on a regular basis. All those funtinality can operated using a single interface from a central location. Vytru, a leading provider of apps and video conferencing endpoints for Microsoft Lync, launches Room Video Conference System Series (RVC), a video conference system series that is built for room-based Microsoft Lync video conferencing. RVC Series will introduce the ever-growing Lync market to a complete portfolio of video conference room endpoints built to meet different market needs. Vytru announces the launch of Room Video Conference System Series (RVC), a video conferencing room system series for businesses and enterprises using Microsoft Lync. RVC Series contributes to enriching the Microsoft unified communications experience and extending Microsoft Lync into the meeting and conference rooms by leveraging Microsoft Lync Video Conferencing infrastructure and RVC smart and rich features. Yet, it makes adopting face-to-face collaboration for Lync-empowered and multi-location organizations more cost-effective and prompt. 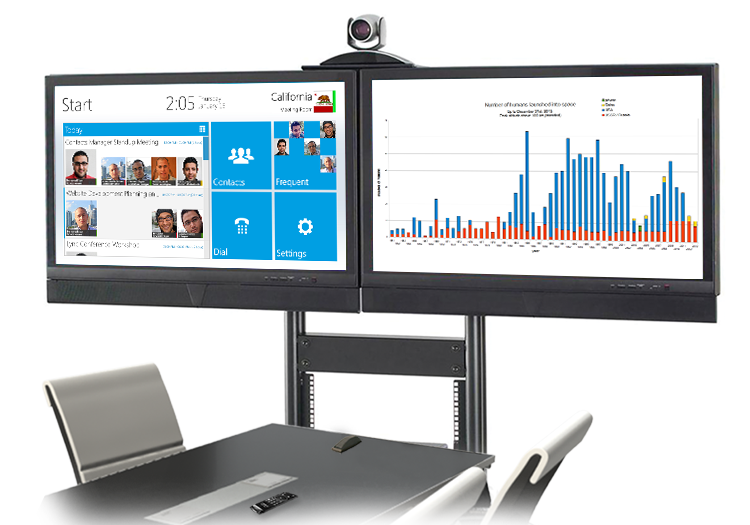 Vytru’s RVC Series is an innovative Room Video Conference system built for Microsoft Lync. 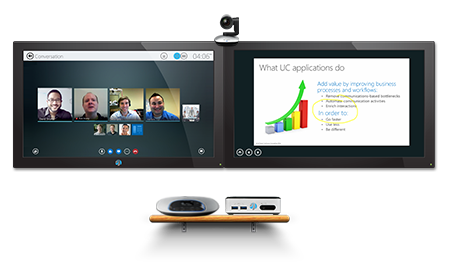 RVC brings Full HD 1080p video conferencing and high-quality audio conferencing together with Smart OneTouch Technology, AirControl controller, modern UI interface, and new features to offer first-of-its-kind Lync room video conferencing experience. All these latest technologies are combined with Vytru’s full suite of server-side management and interoperability applications like Contacts Manager, Skype Connect Gateway, and H323 & SIP gateway to provide a turnkey solution for Microsoft Lync video conferencing. RVC Series consists of a RVC 3000, RVC 4000, and RVC 5000 room systems. All featuring our innovative software and combined with a range of HD 1080p Conference Cameras and audio systems. The RVC Series supports single or dual displays setups and presents a familiar Lync user interface with native integration with Exchange to manage the meeting room calendar. RVC Codec features Lync Contacts, Presence, Audio, Video, IM Screen and Content Sharing, Whiteboard, Dial Pad, and other rich features for Lync Group Video Conferencing. “Vytru is pleased to offer new Lync solutions to clients who are challenged by video Lync video conferencing needs of innovative, accessible, and affordable solutions,” added Ahmed ElShabrawy, CEO, of Vytru. “We help our clients maintain focus on productivity and collaboration and increase their return of investment on the Microsoft Lync platform,” Ahmed concluded. RVC Series will be officially launched at this year’s Microsoft Lync Conference 2014 event (February 18-20, 2014) at Las Vegas. RVC Series supports touch displays so that you can interact with the system with one touch on the display. OneTouch technology is built into the RVC Codec and it ensures your interactions take a single touch to take effect. RVC Series offer support for single or dual displays to help you present the meeting video and content in the most appropriate way you need. The RVC system’s SmartDetect display feature auto-detects whether single or dual displays are connected to the system and then adjusts the user interface accordingly. RVC Series leverages your room system when it is not in active Lync calls and transfers it into an interactive presentation system. You can use the Whiteboard, Camera, and Microphone to deliver presentations, record audio or video sessions, or do a live streaming. You can also connect your laptop to the system and share your screen or share any content on the display. Sit back and relax and enjoy a new experience of Lync video conferencing with Vytru’s AirControl. With in-air motion-sensing technology, AirControl recognizes your gestures and uses your hand movements so you can interact with the RVC system. You can start meetings, share content, annotate presentations, or collaborate on the whiteboard from up to 100 feet away with just the wave of your hand. AirControl also interacts with the on-screen full keyboard so you can search for Lync contacts or type Instant Messages very easily. RVC Series ships with high-quality USB boundary microphone for audio and video conferencing with 180-degree coverage for great sound over a wide range. It guarantees voice quality on Lync conference calls and telephone calls. The conference microphone uses boundary microphone technology and built-in custom circuitry to produce smooth, quiet, and professional sounding conferences. With a radius of 25 feet, you will be clearly heard no matter where you are located in the room. RVC Series adds a set of High Definition 1080p USB PTZ and PT Conference Cameras that deliver a full 360-degree pan and 120-degree tilt functionality on a Plug and Play setup. They deliver brilliant, high-quality color rendering, variable speed pan and tilt functionality, auto or manual focus, wide view angle, and variable zoom options with fixed lens or 3X, 10X, and 22X Optical Zoom. RVC Series integrates with Vytru’s full suite of Lync server management and interoperability applications to add more value, features, and rich integration with other communications systems. RVC offers Contact List and Contact Cards functionality that allow you to display Lync contacts and start ad-hoc meetings with them. With Vytru’s Contacts Manager, you can centrally manage the Lync contact list of all your RVC video conference rooms for an updated list of your organization’s contacts. Our Skype Connect Gateway and MG-20 Media Gateway enables your RVC system to connect with Skype, and other H323 or SIP standards-based video conferencing systems. Over the last five years, Vytru has been dedicated to developing software products and video conferencing endpoints for Microsoft Lync. Vytru’s mission is to make the unified communications experience more practical, effective, and reliable for their clients.